95 line illus. 28 tables. Trade is a cornerstone concept in economics worldwide. This updated second edition of the essential graduate textbook in international trade brings readers to the forefront of knowledge in the field and prepares students to undertake their own research. 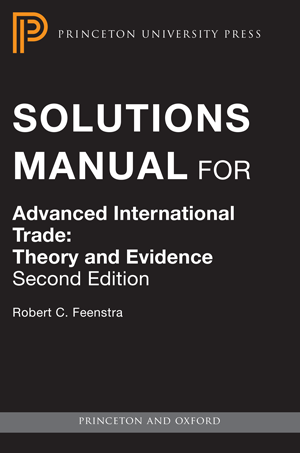 In Advanced International Trade, Robert Feenstra integrates the most current theoretical approaches with empirical evidence, and these materials are supplemented in each chapter by theoretical and empirical exercises. Feenstra explores a wealth of material, such as the Ricardian and Heckscher-Ohlin models, extensions to many goods and factors, and the role of tariffs, quotas, and other trade policies. He examines imperfect competition, offshoring, political economy, multinationals, endogenous growth, the gravity equation, and the organization of the firm in international trade. Feenstra also includes a new chapter on monopolistic competition with heterogeneous firms, with many applications of that model. In addition to known results, the book looks at some particularly important unpublished results by various authors. Two appendices draw on index numbers and discrete choice models to describe methods applicable to research problems in international trade. Completely revised with the latest developments and brand-new materials, Advanced International Trade is a classic textbook that will be used widely by students and practitioners of economics for a long time to come. Robert C. Feenstra is a professor in the Department of Economics at the University of California, Davis, where he holds the C. Bryan Cameron Distinguished Chair in International Economics. His books include Offshoring in the Global Economy and Product Variety and the Gains from International Trade. Professors: A Solutions Manual is available for qualified professors who have adopted this book in a course. To request a solutions manual, email your request to Economic_Supplements@press.princeton.edu Include your name, title, university, course name, enrollment and semester.